This pen was a bit of an impulse buy in my last JetPens order. I was fishing around trying to get the order over the free shipping limit (Which by the way only applies to US residents, so I didn’t get it anyway) and I liked the idea of a simple, disposable fountain pen. 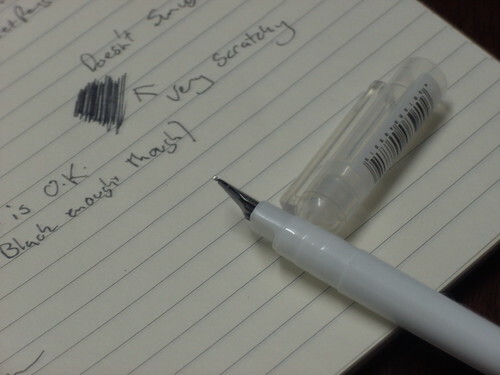 The black wasn’t black enough, and the tip was scratchy, and the pen felt rather cheap in the hand. The black bar behind the name isn’t even an ink level window. It’s just the label. Checking back to the JetPens page, they have marked this particular product as Discontinued. It’s sad when a company stops making pens, even if they aren’t the best. Someone out there probably loves them, and would buy them forever. 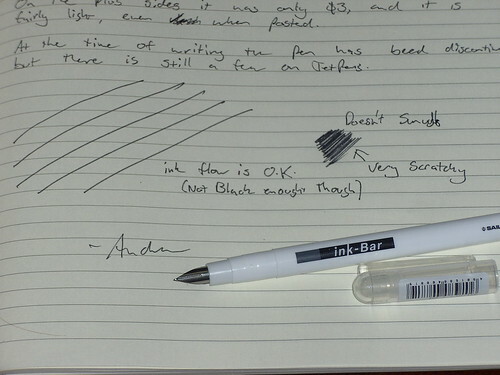 While I wouldn’t recommend it, the Ink Bar writes, and has some positives. For $3 you can’t really complain. I found my first Ink Bar pen to be a very smooth writer, so I suspect the nibs are not identical. 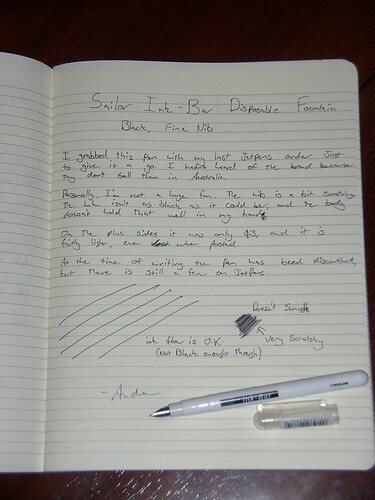 I agree that the ink is not really black enough, but it’s not a bad fountain pen to carry in case of emergency. I agree, if you needed one in a pinch, they come in handy. Which size nib did you have? It’s entirely possible the Fine nibs are the scratchy ones. of all friends concerning this piece of writing, while I am also zealous of getting familiarity.